If you miss a class, please check this page and study the listed topics in your field guide. Click here for last semester's calendar. Note: Please park in the Hayes Street Parking lot. All spaces are available except disabled and reserved drop off for the child care center. If the lot is full and you park in the Grove Street lot you will likely get a parking ticket unless you display the temporary parking passes which are available to all registered students. These passes must be stamped by the John Adams office which closes at 7:30pm! Note: We will be using the 7th edition of the National Geographic Guide. Please register at eBird and email me your eBird ID. I can then offer to share field trip lists with you. Click here for a summary of bird name changes from the 58th AOS supplement 2017. Click here for a summary of bird name changes from the 59th AOS supplement 2018. "Diversity and Evolution of Hummingbirds" - My CCSF Lecture (YouTube Video). My article on Ridgway's Rail being imperiled by Spartina removal is here. The new SFBIRD email list is here. Acorn Woodpecker cooperative breeding information is here and here. Article on the effects of smoke on raptors here. We plan to complete and reviewed the flycatchers on pages 344. My Eastern Phoebe photos from San Francisco. My Eastern Phoebe photos at Pescadero here, here and here. Click here for my photos of the Eastern Phoebe at Cosumnes and here for my images of an Eastern Phoebe on Mt. San Bruno. Click here for a photo of an Estern Phoebe at Santa Maria, here for an Eastern Phoebe in Victorville, here for an Eastern Phoebe in Fresno, here for an Eastern Phoebe in Santa Cruz, and here for an Eastern Phoebe in Madera. Additional Eastern Phoebe images here, here, here and here. Click here for my photo of a Black Phoebe at Lake Merritt. A bird believed to be a hybrid Black X Say's Phoebe is here. An abstract of an article describing a hybrid Eastern X Black Phoebe is here. My Vermilion Flycatcher photos at Morgan Hill and at Colma. Click here and here for a photo of a male Vermilion Flycatcher at Los Banos; here and here for my photos and notes from Belize; here for my photo of an immature male Vermilion Flycatcher at Lodi; here for two photos of an immature Vermilion Flycatcher at San Jacinto WMA; and here for a photo of an immature Vermilion Flycatcher at San Clemente Island. Click here for my photo of an immature male Vermilion Flycatcher in Texas. The Stonechat that was originally misidentified as a Vermilion Flycatcher is here. Click here for my comments on identification of Pacific-slope/Cordilleran flycatchers and their vocalizations. Click here for a spreadsheet comparing the characters of selected Western Empidonax. 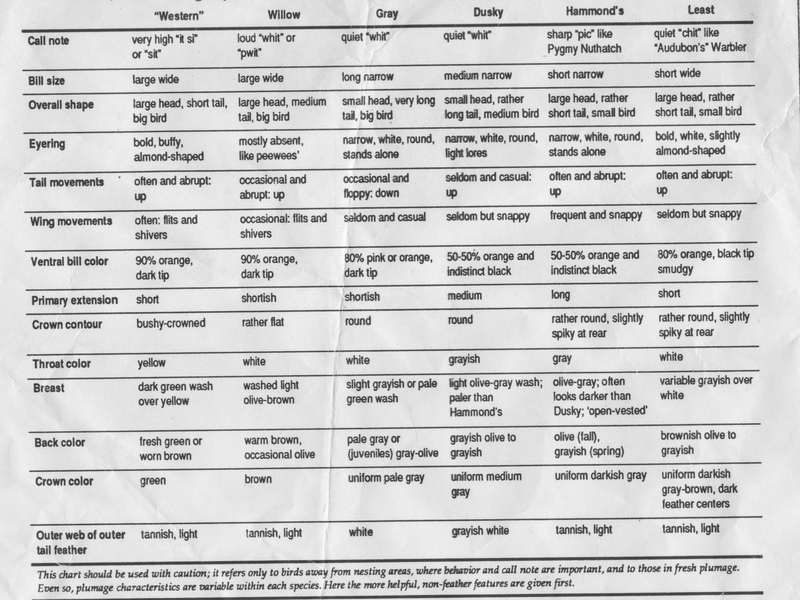 Detailed Empidonax ID chart from Rich Stallcup. This was the last class of the five week quarter. Please register if you wish to continue with Part B starting April 24. Click here for a photo of a Least Flycatcher wintering in Arcata. Click here for photos and discussion of an apparent Least Flycatcher at Point Reyes. Hammond's Flycachter photos are here, here and here. Click here and here for my photo of a Gray Flycatcher and a discussion of its taxonomic history. My photos of a Yellow-bellied Flycatcher from Belize with notes. Click here and here for photos of accepted California Yellow-bellied Flycatchers. Click here for probable Yellow-bellied Flycatcher originally identified as Least Flycatcher (record evenutally submitted as Yellow-bellied and rejected). Click here for a photo of an accepted Alder Flycatcher from the Farallons and here for photos of Alder Flycatcher in Washington state. Click here for photos of a possible Alder Flycatcher from the Farallons showing direct comparison with Willow Flycatcher (record not accepted). Other photos of possible Alder Flycatchers are here, here and here (records not accepted, the first probably being a Hammond's Flycatcher!). Click here for photo and discussion of an unusual "Trail's" type flycatcher from Point Reyes. In his monograph, The Birds of Eastern Kern County, M. Heindel states, "Although extreme notes ("whit" for Willow; "peek", "pik", or "bik" for Alder) are likely diagnostic, Willows can give a hard note, which might be interpreted as one of those described for Alder." Click here, here and here for my photos of Tufted Flycatcher in Costa Rica including taxonomic notes. Click here for my photo of an Olive-sided Flycatcher at Briones Regional Park. Click here for my account with photos of a Greater Pewee in the Imperial Valley. Click here, here, here here and here for photos of other Greater Pewees in California. Click here for a photo of claimed Greater Pewee on the Farallons in June 1998 (record not accepted). Click here for my account with photo of an Eastern Wood-Pewee at Point Reyes in June 1998. Click here for songs and sonograms of two different Eastern Wood-Pewees in California in 1998. Click here for a photo of a claimed Eastern Wood-Pewee on the Farallons (record not accepted). Click here for an accepted record of Eastern Wood-Pewee in Solano County. Eastern Wood-Pewee from Cuba here. Western Wood-Pewee photos here and here. Cuban Pewee photos with notes here and here. Click here for a photo of an American Three-toed Woodpecker in Alaska. Click here for my photo of a Northern Flicker from California and here for one from Cuba with discussion. Northern Flicker intergrades are here, here and here. Gilded Flickers may be distinguished from intergrade Yellow-shafted x Red-shafted flickers by the Gilded's more extensive black on the underside of the tail, more oblong ventral spots, paler coloration and overall smaller size. An article on the Ivory-billed Woodpecker by Sibley et al. in the journal Science is here. Rebuttal is here. Perspective by Jerome Jackson published in the Auk is here. My Pileated Woodpecker photo from Florida. Photos of a Pileated Woodpecker at Lake Solano Park are here.